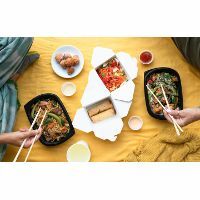 Pei Wei is the leading fresh Asian, fast-casual restaurant brand, where bold, Asian flavors couple sit-down quality with take-out convenience. Menu offerings include wok classics featuring rice, noodle and salad bowls along with lighter options such as lettuce wraps and sushi. Dishes are easily customized for a variety of palates and diets, including gluten-friendly and vegetarian.